I spent an entire day doing nothing but drooling over Sheryl Parsons' papier mache santas. She certainly has the process down to a science. For years I have wanted to try my hand at making papier mache santas but have always let my intimidation get the best of me. I have several books on the subject and have studied and studied them and bought several packages of celluclay but just plain chickened out. Why do we let things get to us like that? I mean, the worst that can happen is that I fail. I loathe failure and let just the mere thought of it keep me away from trying new things. I must work on this and get over that. A true hang up of my character if ever there was one. I am looking to Sheryl right now for inspiration and courage to try this...If I fail then so what? I go back to my comfort zone and do something I feel comfortable in doing, like my painting. 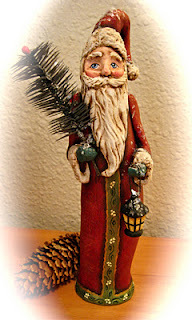 You MUST go check out her blog...it is full of the most beautiful santas imaginable. Right now she is one of my heroes. I am finding several new heroes this year and they are all so creative.